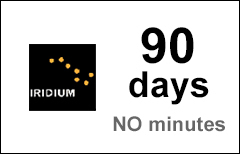 The Iridium 90-day extension voucher extends validity of your existing Iridium prepaid account by 90 days. 3 years Maximum Age Limit. Iridium prepaid minutes that have been carried over for more than three (3) years will be expired from prepaid account balances on a daily basis as they reach their Maximum Age Limit. More information.